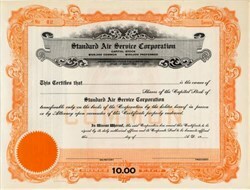 Beautiful unissued certificate from the Standard Air Service Corporation printed in 1945. This historic document has an ornate border around it with the company's name on top center. This historic document has an ornate border around it with the company's name on top center. This item has the signatures of the Company�s President, Robert E. Whipp and Secretary, Mildred Gibson Wright. The certificate was issued to John Winthrop Wright and Mildred Gibson Wright and endorsed by them on the back. The certificate was attached to the ledger page by tape on the left side when it was redeemed. John Winthrop Wright was the chairman and CEO of Wright Investors� Service, a privately held, international investment management and advisory firm in Milford, Connecticut. He also founded the The School for Ethical Education in 1995. Mildred Gibson Wright was the wife of John Winthrop Wright.